Happy Memorial Day! We are still raining and flooding in areas down here (not near me thankfully! ), so our three day weekend has been mostly spent inside catching up on TV and house chores, online sale shopping, and cuddling with my puppy. 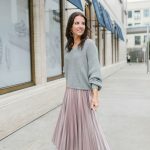 If you are stuck inside like me, there are still some awesome sales going on at Nordstrom, Baublebar, and Elanie Turner this weekend just to name a few. All three are also in this post so you can score discounts on some of the items. 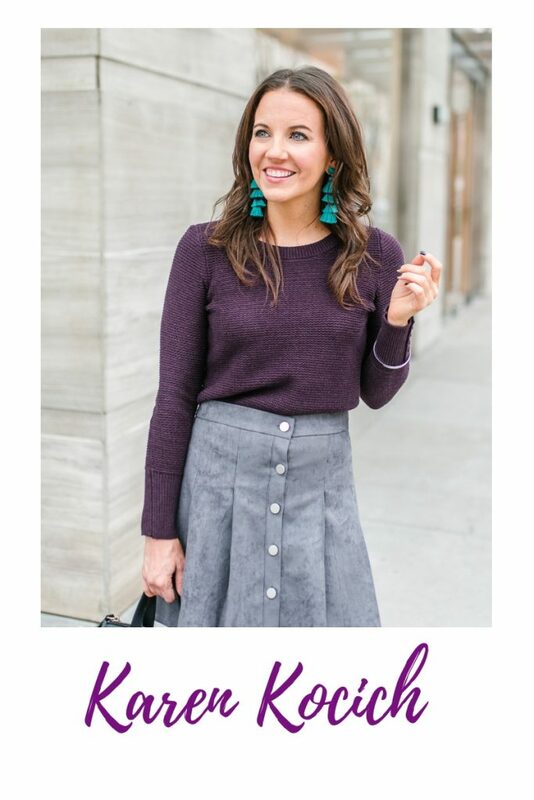 My favorite weekend purchase so far are these earrings from Baublebar! They remind me of fireworks and I will be stalking my package tracking until they arrive! 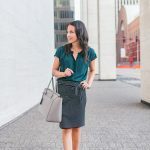 I may be spending the day in my pajamas, but I’m sharing a little office style on the blog today! 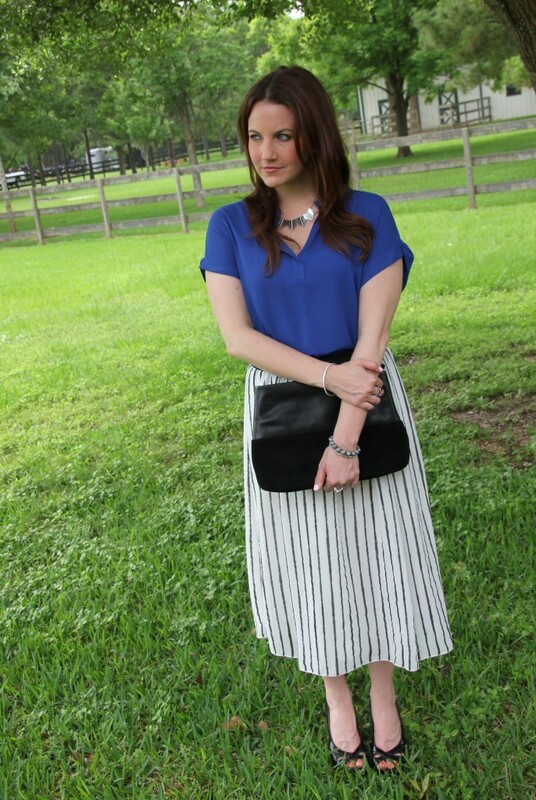 I LOVE this midi skirt!!! I found it during the triple points event at Nordstrom earlier this month. It is super light and airy, perfect for our hot and humid weather. My sister was able to catch how beautifully it moves in the breeze. 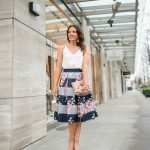 I immediately knew I wanted to pair this skirt with a blue top. Pleione is quickly becoming one of my favorite brands at Nordstrom. I own about four tops from them, and they are all extremely comfortable. 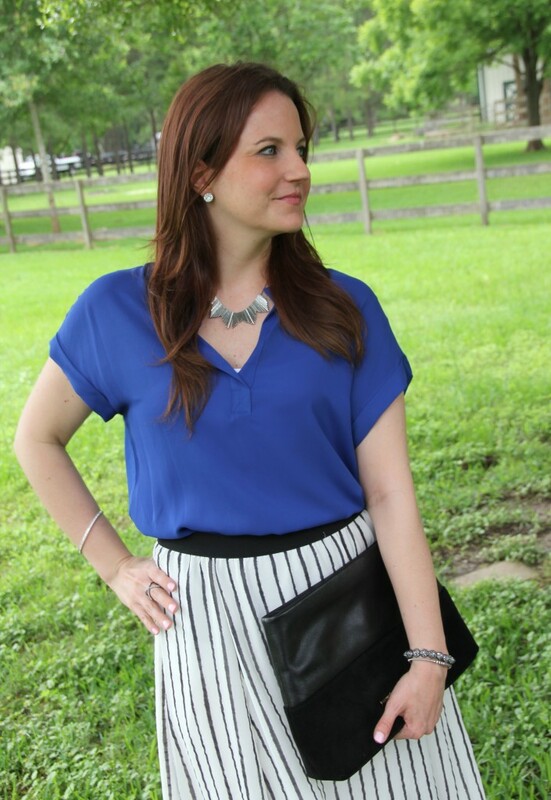 This split neck blouse is perfect to pair with skirts, but it also pairs really well with jeans and shorts too. Office and weekend looks meant I had to have this top! It also comes in a few other colors too. 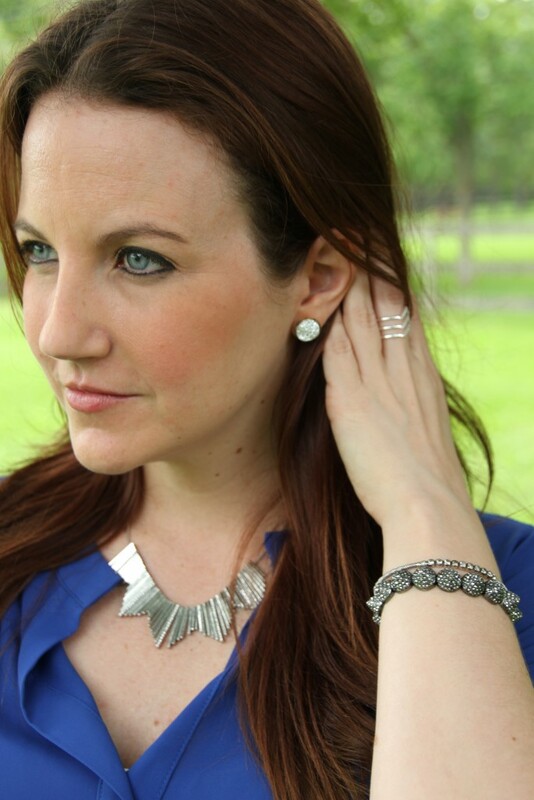 I am also wearing my latest jewelry from my Rocksbox subscription. I had this necklace on my wishlist, and was very happy to see it arrive in my box. I had seen a similar necklace on a friend, and could not stop thinking about how fabulous the necklace was and how may ways I could wear it. 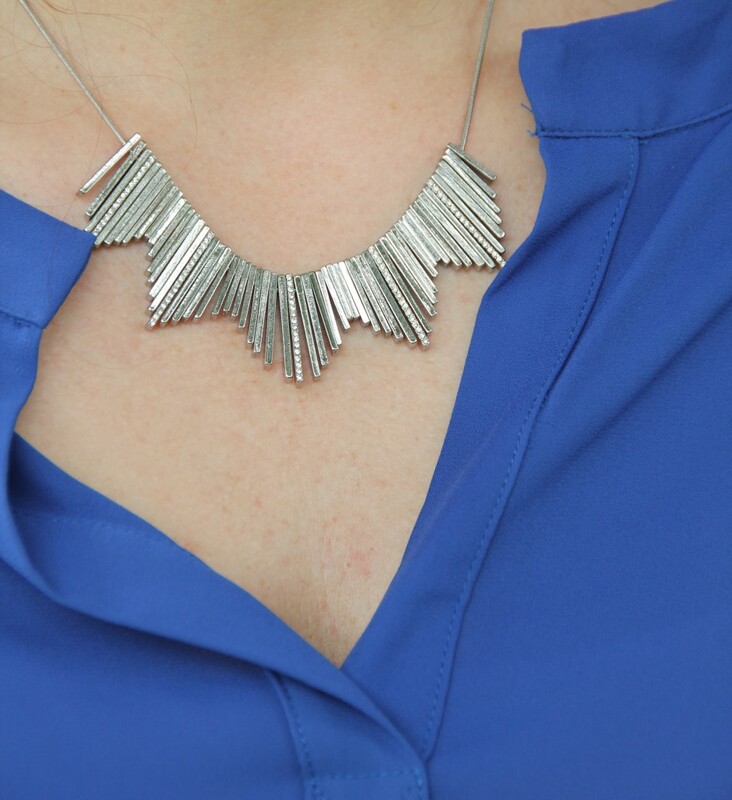 The necklace is a bunch of small bars, so the movement of the necklace is pretty cool. I also received this Vanessa Mooney bracelet which is perfect for my small wrists. I am pleased to see that they are taking all my feedback into consideration when sending each box. I had mentioned how big the bangles were with my second box, and here on my fourth they are still taking it into consideration. I have listed the full item names above, so if you are a Rocksbox subscriber you can search for them and add to your wishlist if want to play with these too. I am almost done with my big review of my first few months with the Rocksbox service, so look for that to be on the blog TOMORROW!! Thanks for stopping by!!! 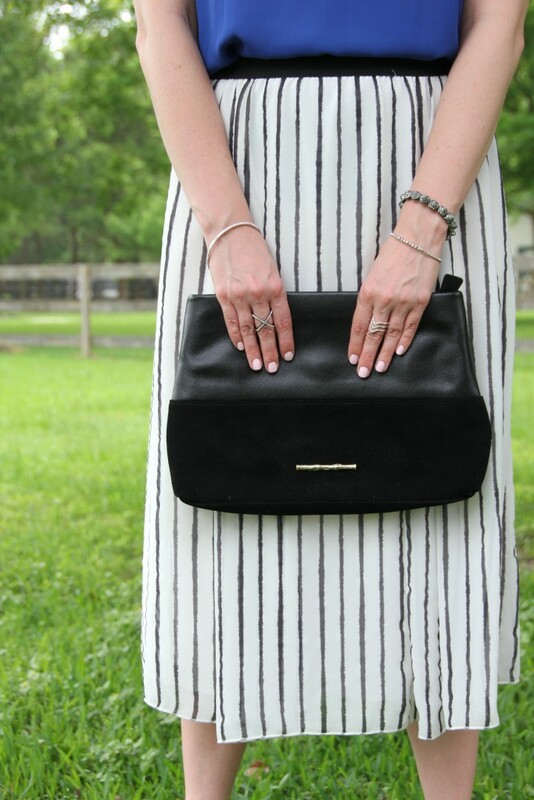 PS – Don’t forget to enter the Canon Rebel and Kate Spade giveaway! Head to the bottom of last Tuesday’s post to enter the rafflecopter! Beautiful look, I really love the skirt, looks great paired with that blue blouse and necklace is perfect. Love the color combo! 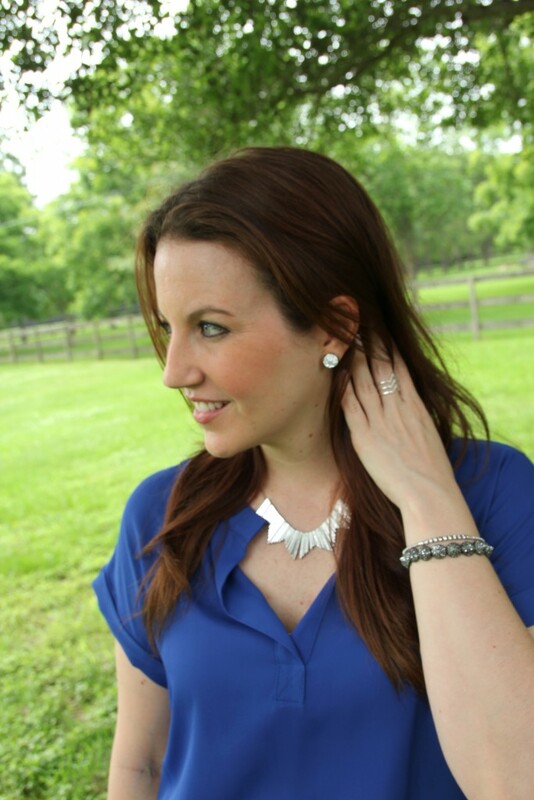 Great necklace from Rocksbox. 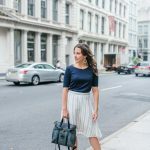 Love the stripe skirt – that will be a classic you can wear again and again for sure. What a pretty outfit!! I just jumped on the maxi bandwagon (better late than never, right?) so next on my list is the midi trend 😉 I’m pretty short, so I just need to make sure the midi doesn’t turn into a maxi! I love that necklace and the whole Rocksbox idea! Beautiful look and skirt. 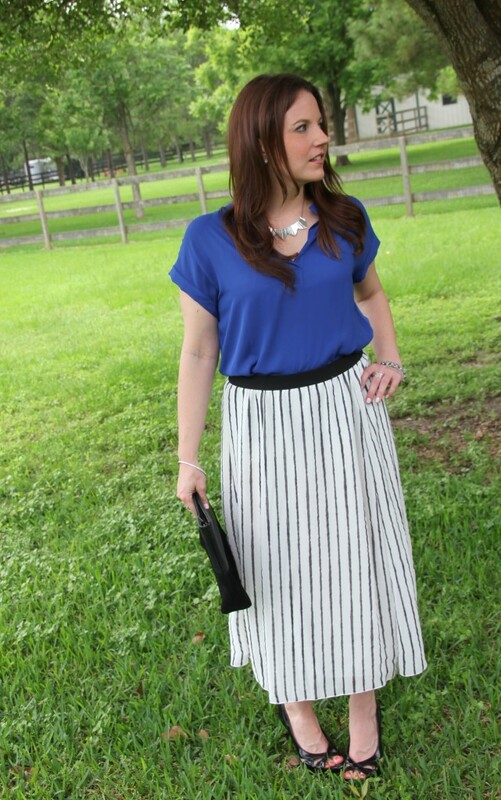 The skirt almost looks pleated with the vertical striped design, cute! This is such a pretty and ladylike look! 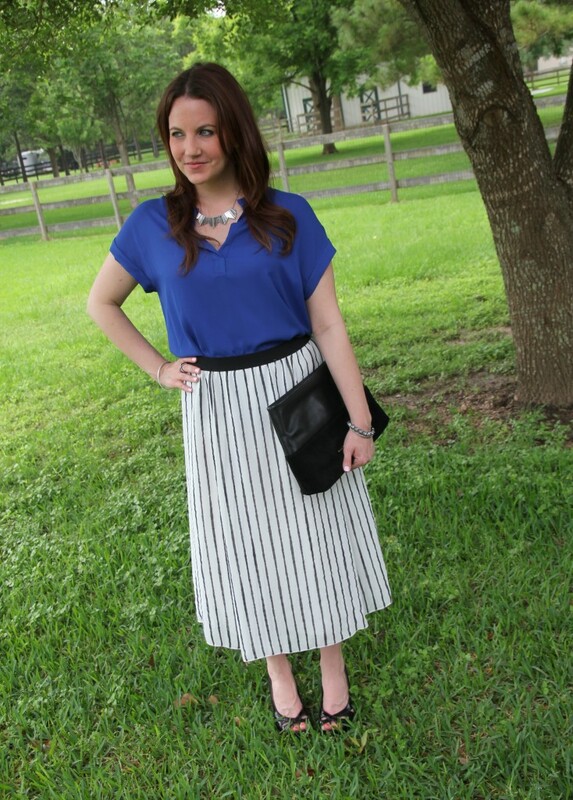 The blue blouse pairs so well with the striped skirt. I love that skirt! It’s so perfect for the office! Also, your nail polish is such a pretty colour. What shade is that? Thanks! It’s Essie brand, the color is Fiji. I found your blog on #SocialmediaWeekly this morning, then noticed this post on #MotivationMonday. I am so glad that I did. 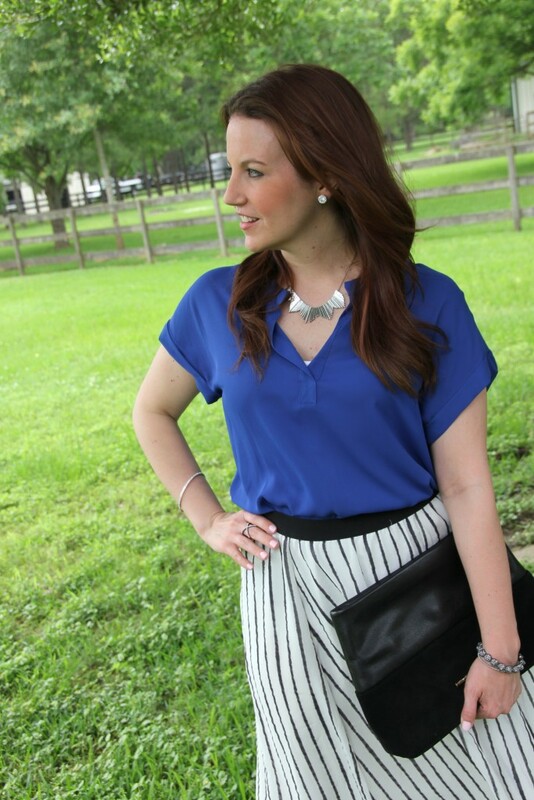 I love this blouse … and I did not know that Nordstrom offers free shipping and free returns! Yay! Yes! I love their free shipping and returns!! Their packages usually arrive very quickly in about 4 days too!! Great skirt and love the way you accessorized! This is a very pretty, lady like look! That skirt was a great find. Beautiful! This is such a great color combination! I love the color combination. Looks great on you! Have a great memorial day!